What are we thankful for this year? So many things! We’re thankful for our volunteers, the donors who provide financial support, and a giving community. We’re thankful that we have access to healthy food and a network of health care providers who recognize the value of nutrition for their patients. And we’re thankful for pie! Avoid snacks before dinner or put out only healthy, low calorie snacks like fresh fruit and a vegetable tray with hummus. Position yourself out of reach of food while socializing to avoid mindless snacking. 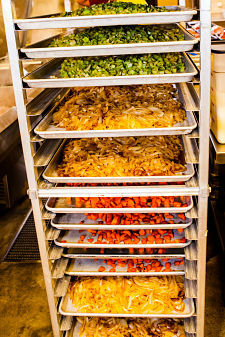 Project Angel Heart’s chef and volunteers chop, stir, scoop, bake, blend, clean, and pack daily to prepare 1,200 nutritious meals each day. Want to come see us in action? We’d love to take you on a tour! Contact Brandy Brogan at bbrogan@projectangelheart.org or 303.830.0202 to schedule. How Do You Know if You’re Getting Enough Fruits & Vegetables? Whether you’re vegan, paleo, or somewhere in between, the one thing nearly everyone can agree on is the importance of eating fruits and vegetables. The benefits are too numerous to list- and include longer life expectancy and lower blood pressure.